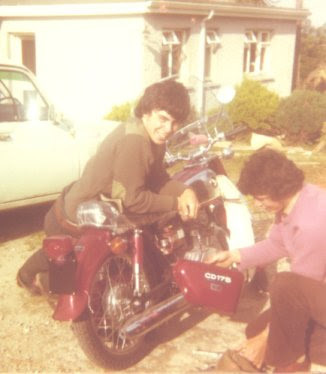 My brother Joe bought a Honda 50 from Damian Doyle of Carnew in 1977 so that he could use it to go to school in Bunclody. In one of those "small world" coincidences, Joe's son Niall goes to school with Damian's son Harry in Bunclody! Of course, I got to ride the Honda 50 as well - I didn't know at the time how uncool this was, or that it would be the first of several bikes that I would ride. I remember feeling particularly cool once when riding home in the dark smoking a cigarette. The tobacco burned down inside the cigarette paper as the wind blew in my face. I was only 18 or 19 at the time, so to me this was cool! 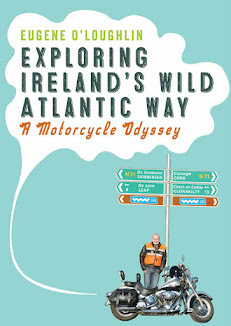 The picture here was taken during a family summer holiday in Cork on which Joe took the bike. 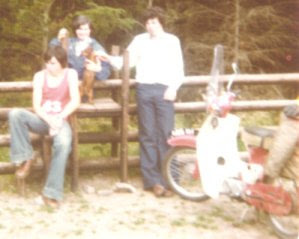 As well as the Honda 50, the picture features my Mum, Joe, our dog Pheobe, and me in very fetching flares! After the above Honda 50 Joe bought a new Honda CD175 - the picture shows Joe and me with the bike on the day he bought the bike (note plastic still on seat). Look at that hair! The bike is not yet registered - it was later to get the number 8923 NI. I still have the registration book. In the background is a Renault 4 van in which I learned to drive. Joe bought a car within a few years - I think in 1980 and this bike "became" mine. I loved it and took it to Dublin while I was in Trinity. My landlady, Mary Dillon-Kelly, used to allow me to park it in her front hall! I used the bike to commute from Drumcondra to Trinity, and also going up and down home to Ballingate. Sadly, this bike was stolen on 8th December, 1981. At the time I was staying in Rooms in Botany Bay at Trinity and used to park the bike in the shed beside the tennis courts. The previous evening I had returned from Ballingate and I remember the weather was really bad. To this day I am not certain that I locked the bike properly - so it was possibly easy to steal. I reported the theft to Pearse St Gardaí, but no trace was ever found. My motorbiking days were over for 18 years. In September 1999, the QBC on the Stillorgan Road was opened. The significance of this is that my morning commute from Blackrock to Clonskeagh was doubled in time as I used to use the inside lane to drive to work in my car. I didn't have the patience for this. One day I said to Roma "I should get a motorbike again" and guess what - she said "Why not!". In October 1999 I turned 40 years of age - some people think that there is a link here! I went to a bike shop on Pearse St and after looking at several bikes I settled on a Honda 250N Nighthawk. It was blue and was the same as the one pictured here. I had it for a few weeks before I got a licence and insurance. My first trip on it (to Deansgrange) was very strange and wobbly! It took a lot of getting used to - soon however, I was riding like a natural and started the work commute soon after. One problem with this bike was that it was very light and used to fall over in strong winds when parked. Happy days - I loved the "freedom" that a motorbike provides and was delighted to be back on two wheels again. In January 2000 I was on a SmartForce trip to Scottsdale in Arizona. Now that I was a biker again I decided to visit a bike dealer near the Hotel - Harley-Davidson naturally. I was mesmerised by the colour and style of the Harleys - beautiful machines. I didn't have the courage to hire one. I did buy a denim jacket in the shop and I do remember joking with the Shop Assistant "I suppose I'll have to buy a Harley in order to wear this". I never had a denim jacket before and this was my reason for buying one. I also promised myself that I would investigate Harleys on my return to Dublin. I visited Harley-Davidson Dublin soon afterwards and was interested in two second-hand Sportsters. However, they were expensive - one was almost £5,000, while the other was over £5,500. A new one was about £8,000 - so I decided to go for it. I bought a white 883 Hugger like the one pictured here. 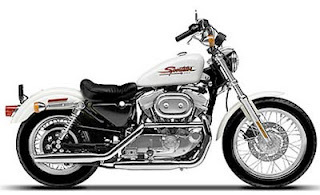 I was warned that everyone who buys a Sportster sooner or later wants one of the big Harleys. My longest trip on this bike was to London for the "Last Ever CBT Systems Party!" in October 2002. This was just after SmartForce was taken over by Skillsoft and I had already applied for voluntary redundancy. It took me most of the day to get there and I had a severe hangover for the return trip. I customized this bike a lot. But on my last trip to Scottsdale in Arizona I hired a Fat Boy and was bitten by the Big-Twin bug. 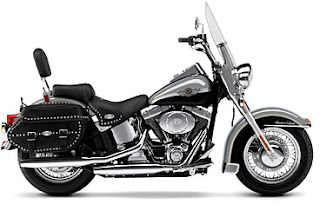 With 2003 - the centenary year for Harley-Davidson - around the corner I decided that I would buy a centenary model Heritage Softail Classic. This bike is the King of Bikes and is my most favourite thing that I possess. I ordered it in 2002 for January 2003 delivery so that I would have a special centenary edition. I spent a big chunk of my SmartForce redundancy money on this bike - but it was worth every penny. It looks just like the stock photo here. My number plate is 03 D 1903. You'll see elsewhere in this blog that I have travelled quite a bit on it. I have added quite a bit of custom material to it. I have changed the pipes, added light covers, and lots of pieces of chrome. It has cost a hell of a lot to maintain - tyres are expensive, I have also torn the drive belt, and once destroyed a new tyre with less than 500 miles on it by riding over a metal peg in Booterstown. 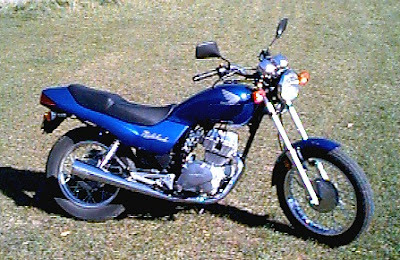 I would still like to customize it some more - I'd like higher handlebars that would help me to sit straighter on it. A new saddle would also help. I don't think I'll ever change this bike for another - it's my dream bike! I don't know what will happen to it when I stop riding. I have promised it to Kate, or maybe I'll have some Grandsons who might be interested in it.